Campers have fun in the healing mineral waters of the Nunisi resort in central Georgia. For all the campers, Samta Park represents a soothing escape from their hardscrabble lives in Tbilisi. Many have suffered severe psychological or physical traumas. Lela Mezrishvili, 13, has scars all over her body, but several sessions in the sanitarium’s waters have allowed her to extend her arm fully for the first time in years. The camps of Sister Arousiag Sajonian and Father Witold Szulczynski are different in structure, but their aim is the same. They offer disadvantaged children a quintessential childhood experience that is normally available only to the more privileged. And it is a testament to the camps’ success that so many former campers have returned, as adults, to help educate the next generation. A mere two carefree weeks can have an outsized impact on the children’s lives, said Ms. Inadze, the former street child who now works for Caritas. 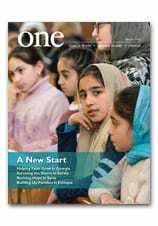 For more, read Kid’s Camps in the Caucasus in the November 2007 issue of ONE.